Shohei Ohtani was supposed to win the American League Rookie of the Year. And, you know, he still might, depending on how he recovers from his injury. His numbers are great, and he deserves a bonus for the degree of difficulty of his job. But Ohtani’s elbow makes me nervous, and I’ve become skeptical about these things. You can’t count on him coming back and looking like himself. And as the award goes, that would open up the door. One prime contender would be Gleyber Torres. Another strong contender would be Miguel Andujar. And as I look at things, the Yankees might very well run the table. Rookie of the Year voters select three names. Torres or Andujar could finish first. The other could finish second. And Domingo German could finish third. Or, I suppose, second or first, if he had a really good second half. But the point here is that the Yankees have three great and significant rookies. In March, Torres was considered the Yankees’ No. 1 prospect. Andujar was considered their No. 2 prospect. German slotted in at 13th. A month and a half ago, Travis wrote about German right here. Since then, over 40 innings, German has allowed 28 runs, which is too many. Yet he’s also generated 45 strikeouts, with only a dozen walks. He’s turned in three strong starts in a row, and four times in a row, now, he’s gone at least six innings. I will not be making the point that German is amazing. I will be making the point that he’s probably being underrated. That might just be a consequence of how loaded the Yankees already are. One reason German has come on quietly is because there have been questions over whether he could start. That’s still very much a question, I guess — German has started just eight games in the majors. He missed all of 2015 because of elbow surgery, and at some point this year he’s likely to run out of innings. The Yankees are examining the trade market, and they might not want to count on German for the stretch run. He could also be actively changing their mind. German was dominant against the Mariners on Tuesday. He’s taken over for Jordan Montgomery, and he’s flashed all kinds of skill. I could sit here and editorialize, but I’d rather just show you some data. Here’s what I did: I gathered relevant numbers for every starter this season who’s thrown at least 40 innings in the role. In the following plot, you see German’s various percentile rankings. I’ve added a horizontal line at the 50th percentile, just for ease of understanding. It should become immediately apparent that German has something special going on. German is below the black line by exactly one measure: park-adjusted ERA. That also happens to be the number I care about the least, at least when you’re dealing with smaller samples. He clears the line by park-adjusted FIP. He clears the line by park-adjusted xFIP. He clears the line by wOBA allowed, and he clears the line by even more by expected wOBA allowed. By xwOBA, German ranks in the 87th percentile. He’s there around names like Miles Mikolas and Jack Flaherty. The best-looking numbers here are the contact measures. German has been very good at missing bats in the zone. He’s also been very good at missing bats out of the zone. What does that add up to? Look at the rate of swinging strikes. For every 100 pitches German has thrown as a starter, he’s generated 16 whiffs. The only starter — the only starter — with a higher whiff rate right now is Max Scherzer. I understand that whiff rate isn’t everything, and I understand that German’s control is ahead of his command, but when you sort by swinging strikes, you get a list of extremely talented pitchers. German belongs among them, because he’s earned the numbers he has. German throws a mid-90s fastball. He actually throws two kinds of mid-90s fastballs. One is more of a spinner, and one has more horizontal break. That’s the way it typically goes. But you can see some evidence of how the Yankees have gotten German to buy into their big-league pitching philosophy. While German is young and throws hard enough to fall in love with his heat, as a starter he’s thrown just 46% heaters. 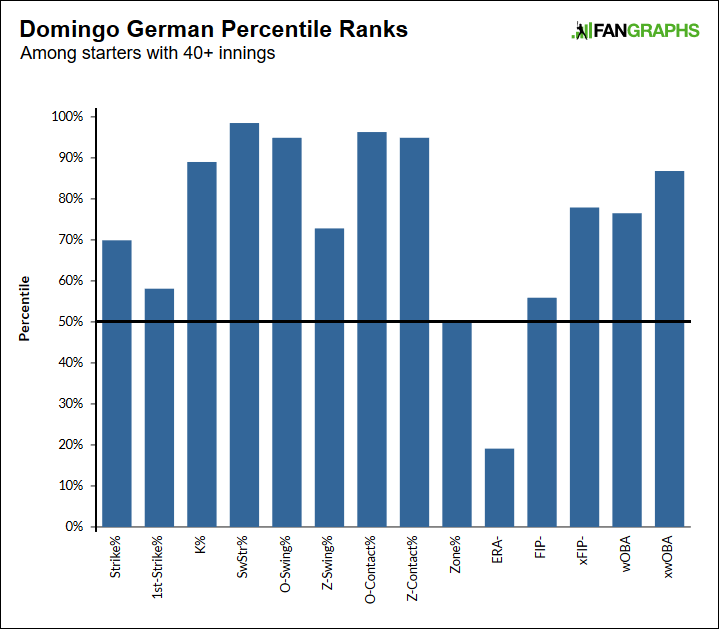 When behind in the count, German’s fastball rate ranks in the 6th percentile. When even in the count, it ranks in the 10th. When ahead in the count, it ranks in the 79th. You don’t get a lot of hard-throwing rookies who are comfortable pitching backwards, but that’s what German has been doing, leaning on his excellent curveball and developing changeup. How advanced is German as a starting pitcher? It goes beyond his high swinging strikes, and his low fastball rate. I looked at every starting pitcher in baseball, and I figured out their strike rates on non-fastballs. German ranks seventh. He’s someone who doesn’t just mix up four pitches — he mixes up four pitches with confidence, somewhat channeling teammate Masahiro Tanaka. When a pitcher can throw his secondary stuff for a strike, that makes the prospect of hitting him all the more challenging. It helps to explain why German’s chase rate is as high as it is, even though he’s also gotten plenty of called strikes. His approach has been a tough one to figure out. The injury history is a variable, and there’s also no getting around the fact that Domingo German does have an elevated ERA. His run prevention has been a step or two behind his contact prevention, and for that reason, German might currently be easy to overlook. But I don’t like to think very much about what’s already happened. I prefer to think about what’s likely to happen down the road, and, down the road, most of the time, talent wins out. Domingo German’s swinging-strike rate basically proves his talent. And he’d probably be a bigger deal if he pitched on some other team, some team that wasn’t already so packed. If German were on, say, the Royals, we might be thinking of him as their equivalent of Luis Castillo. We might be more likely to see him as a developing No. 1 or No. 2. As is, German is fighting to remain in the Yankees’ rotation. Maybe he won’t stick all the way through this year. He’d still be an intriguing option for the next one, and for the one after that. We hoped you liked reading Domingo German Seems Incredibly Talented by Jeff Sullivan! Couldn’t happen to a more deserving team -FINALLY the Yankees catch a break! Agreed. There is nothing more deserving than a team with a sharp front office that has hired the right people to make smart, analytical decisions. That is what Fangraphs is all about, isn’t it? They didn’t have a very good front office until recently though. Their poor decision making was notorious from around 2001 to 2016 or so, and they papered over their screwups with money.